Two adults in “West Bay” in Gogebic County, Michigan. 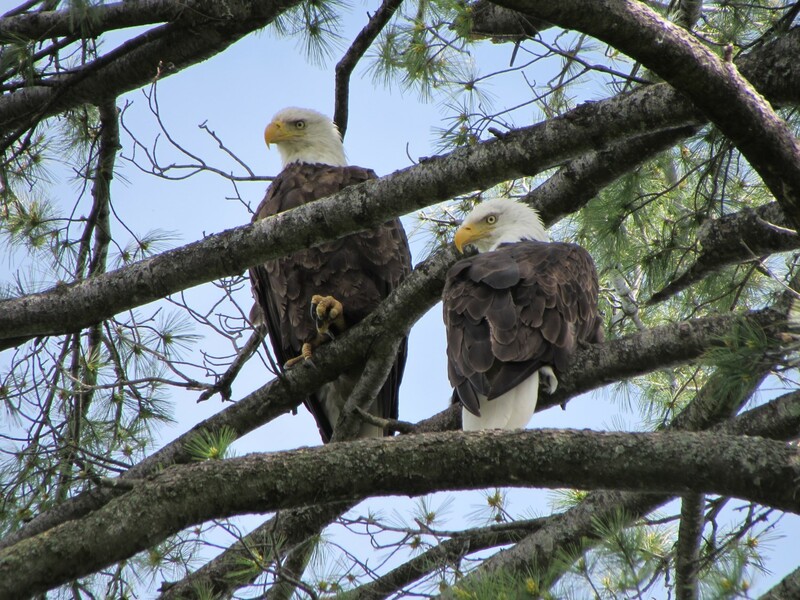 This is the story of how William Ruckelshaus, the First USEPA Administrator, and John Mathisen, the Forest Wildlife Biologist on the Chippewa National Forest, working independently, were the two people most responsible for saving bald eagles. One is known for banning a number of persistent organic pollutants (POPs) from use in the environment, the other for developing a series of land management actions that protected the eagles’ nesting habitat. In 1961, the National Audubon Society began the Continental Bald Eagle Survey with the goal of documenting all of the nesting eagle pairs in the 48 contiguous states. Only 487 nesting pairs were found that year, with 52 of these located within my primary study area of Michigan. Eagle numbers had noticeably declined in areas where there was some monitoring going on in the late 1950s and no one understood why. What were the factors that were behind the decline in nesting eagles, the behavioral changes that found some dis-interested in nesting, and others laying eggs that had very thin shells that broke during incubation? One of the theories that was conceptualized in Rachel Carson’s book “Silent Spring” was that the rise in the use of organochlorine pesticides in agriculture after World War II was impacting breeding birds. The causal relationships between DDT and egg shell thinning were later proven in both field and laboratory experiments. The relationship with DDT was linked to the decline of many avian species across the world, with the greatest effects observed in birds of prey that ate other birds and fish. These studies provided the evidence for biomagnification, where concentrations of pesticides increased in organisms higher on the food web. While these studies of effects on birds were extremely important, the primary reason that William Ruckelshaus cited in his ban of DDT was for “human carcinogenic effects”. The USEPA’s ban of many of the organochlorine pesticides that biomagnify was instituted in the early to mid 1970s. While many of the POPs are still measured in plasma from nestling eagles and infertile eggs of bald eagles that we collect in the nests, the concentrations have declined quickly since the bans and eagle reproduction rebounded by the mid-1980s. This ban is recognized as the primary reason that eagle recovery occurred. The other activity that was adopted by every one of the five Bald Eagle Recovery Plans, required under the auspices of the Endangered Species Act, was the management of nesting habitat, developed by John Mathisen, at the Chippewa National Forest. The management of nesting habitat was accomplished by using a series of concentric rings around active nests. All human activity was prohibited within 1/4 mile of a nest site during the breeding season and no land management activities were allowed within this zone. Within the next zone (1/4 to 1/2 mile from a nest), activities could occur only during the non-breeding period. A third zone from 1/2 to 1 mile from a nest restricted management activities to only those that would improve eagle habitat. Active management activities include providing trees for nesting, perching, and also protection of local food sources. Since some eagles were very sensitive to human disturbance during the breeding period (from courtship through the growth of nestlings to the time when they could fly) the nesting areas were closed to all human activities. This included closing roads, trails and campsites. This method of habitat management is cited by the U.S. Fish and Wildlife Service as the other main reason that eagle recovery occurred. These two actions brought eagles back from 487 breeding pairs in the continental U.S. in 1961, to nearly 5,000 breeding pair in my immediate study area of Michigan, Wisconsin, and Minnesota currently. This success story attests to the positive impact of several Federal Laws passed during the Nixon Administration. These include the Endangered Species Act, the National Environmental Policy Act and creation of the USEPA, and the Clean Water Act. In concert, improving environmental quality and protecting the habitat has had a positive result on breeding bald eagles and allowed for them to be taken off the Endangered Species List. We continue to monitor eagle populations in Michigan in my lab here at the University of Maryland. My own journey with bald eagles began in 1984, when Dr. Richard Brewer, my ecology professor, encouraged me to go to graduate school based on a research proposal I wrote for his course. The encouragement of a single faculty member has resulted in the ability to acquire the funding that has resulted in research contained in over 45 MS and PhD theses and dissertations, including my own. While eagle populations have recovered, we still find legacy POPs in the tissues of eagles and have indications of continued adverse effects to individuals. We have also found that eagles are quite sensitive to environmental changes including earlier nesting along the Great Lakes shorelines that is most likely linked to the changes in ice cover from Global Climate Change. We also have observed that cleanup activities such as dredging of contaminated sediments to remove them from aquatic systems or control of water levels in impoundments to decrease methylation of mercury, leads to immediate decreases in concentrations of pollutants in nestling eagle tissues. While bald eagles are the National Symbol of the U.S., the work of our lab and other collaborators across the U.S. have shown that they are also a sensitive indicator of the health of the environment. It is also amazing to note that their recovery can directly be traced to the positive actions of two individuals, William Ruckelshaus and John Mathisen. For everyone who enjoys seeing an eagle soar overhead, we owe both of them a big “thank you” for a job well done. This entry was posted in Arts, Education, Features, News, People/Places, Politics. Bookmark the permalink.